The following two videos contain the Amritsar Massacre scene from Gandhi (Attenborough, 1980), as well as the three scenes following it. After the clips, you'll find a sample rhetorical analysis. Prior to this sample is a summary, which should remind you of the crucial difference between summary and analysis. Remember: in your essays, avoid summary and observation like the plague. At times, you may need to note the context for a point you're making. Do this as quickly as possible and then get immediately to argument and analysis. In 1919 the British General Edward Dyer fired upon an unarmed crowd of protesters in Amritsar, India, killing 379 and wounding about 1,200. In his film Gandhi (1982), Richard Attenborough depicts the massacre and its immediate impact in a 10 minute sequence, in which he condemns British control of India by first providing physical evidence — in his shifting settings, with their emotionally-laden sounds, colours, images, and words — and then by disarming the British with his well-crafted, logical, and straightforward words. Each setting in the sequence increasingly suggests that the British either shouldn’t or don’t control India. The resolute way that Dyer lines up his troops and fires into the crowd initially seems to suggest that he, and the British government he works for, are firmly in control. Yet why, one might ask, does a government need to use its military force to fire upon unarmed citizens? In the next scene Dyer is being court-martialled. While Dyer will be punished, still it is the British who control the courtroom proceedings. Yet this control is set up to make points against the British (the main point being, How did a man like Dyer get to have so much power?). This tenuous control slips drastically in the third and fourth settings, in which Gandhi visits the site of the massacre and then tells the top British administrators that they’ll leave India. That Gandhi delivers his ultimatum to the top power in the land, the viceroy, and that he delivers this message in the viceroy's government house, suggest that Gandhi will disrupt British power at the highest level. Thus audiences go from the street level, where Gandhi’s ideals are put into a very dangerous practice, to a government house, where Gandhi’s arguments threaten to bring down that house altogether. Attenborough uses sound, colour, and image in the first three scenes to give the audience strong emotional reasons to agree with Gandhi in the fourth. The shrill, piercing violins in the first scene reinforce the harsh sounds of the tank, Dyer's orders, and the gun-firing. These "European" sounds contrast with the Indian music played while the protest leader cries out Gandhi’s message of non-violence. Also, mournful Indian music is played while Gandhi and Nehru look at the deserted compound in the third scene. Here Attenborough adds the image of red of blood on a well — a reminder of the image of the motherless baby we saw at the end of the massacre scene. Colour — and the symbolism of colour -- is also used when Attenborough shifts from the wailing motherless baby to the courtroom, with Dyer's face against the background of a gigantic flag: the red, white and blue of the Union Jack. Symbolically, it is not just Dyer, but the entire British Raj, that is on trial here. Emotional words complement the non-verbal rhetoric in the first three scenes. In the first scene, the speaker espouses Gandhi’s strategy of peaceful resistance: “That is why the Mahatma begs us to take the course of non-violence! . . . If we riot, if we fight back, we become the vandals and they become the law! If we bear their blows, they are the vandals.” His words echo Gandhi’s previous statements in the film and they anticipates Gandhi’s words to the Vice-Roy in the final scene: “one hundred thousand Englishmen simply can’t control three hundred fifty million Indians if the Indians refuse to co-operate. And that is what we intend to achieve – peaceful, non-violent, non-co-operation.” In the second scene, one judge asks Dyer, "Did you know there were women and children in the crowd?" and "How does a child, shot with a 303 Lee-Enfield, apply for help?" These questions make us think of the first scene, with the child wailing next to the well, yet they also connect to the third scene in which Gandhi and Nehru are staring at the bloodied well as birds circle mournfully overhead. In this last scene, Gandhi not only interrupts the viceroy as he circles the table and 'lays down the law,' but also disarms the British with his well-crafted, logical, and straightforward words. He mixes complex reasoning (that the well-educated British elite would respect) with powerful metaphors and simple, direct imperatives. He respectfully tells them that "despite the best intentions of the best of you, you must humiliate us to control us"; he tells them that they "are masters in someone else's home"; and he concludes, "It is time you left." When asked if he expects the English to walk out of India, he responds, "Yes," and explains simply that the British population is far outnumbered and that Indians can be marshalled by ideas of non-violence and non-cooperation. The success of Gandhi’s arguments is seen in the way the viceroy lowers his head and looks downward, the body language strongly suggesting shame. Gandhi's threat of non-violent non-cooperation takes us full circle, back to the protest leader who pleads for non-violence seconds before the noisy, bloody massacre starts. 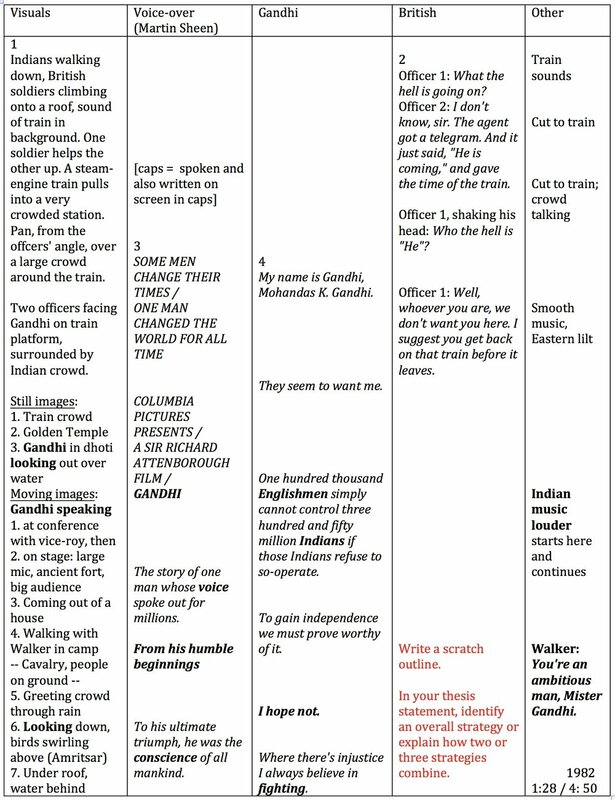 The ten minute sequence thus moves from the sacrifice of peaceful protesters, to a table at which the same ideals are espoused much higher up in the hierarchy of power — a table at which top British administrators fail to justify their rule to Mohandas K. Gandhi, the spiritual leader of Indian Independence, or to the two other men who will play key roles in coming history: Muhammad Ali Jinnah, the future Governor-General of Pakistan, and Jawaharlal Nehru, the future Prime Minister of India, the world's largest democracy. Attenborough's film is of course about Gandhi, but Attenborough's point here is that the Amritsar Massacre has pushed him to speak forcefully for an entire subcontinent. Attenborough condemns British control of India by first providing physical evidence — in his shifting settings, with their emotionally-laden sounds, colours, images, and words — and then by disarming the British with his well-crafted, logical, and straightforward words. Each setting in the sequence increasingly suggests that the British either shouldn’t or don’t control India. Attenborough uses sound, colour, and image in the first three scenes to give the audience strong emotional reasons to agree with Gandhi in the fourth. Emotional words complement the non-verbal rhetoric in the first three scenes. In this last scene, Gandhi not only interrupts the viceroy as he circles the table and 'lays down the law,' but also disarms the British with his well-crafted, logical, and straightforward words. — Union Jack: Britain condemns Dyer? Britain on trial? — Gandhi’s complex, tight syntax -- appeals to educated British elite? -- The introduction takes your reader from a general state of awareness to your particular subject. -- The thesis statement tells the reader exactly what you’ll be saying about your subject; it presents your overall argument in a condensed form. -- The topic sentences show your reader how each subsidiary point you are making advances your overall argument. -- The conclusion highlights your overall point, and either completes any scenario you developed in your introduction or suggests further avenues of enquiry. Make topic sentences specific and linked - not general and listed. Lord of War: T.s.1: Niccol’s use of puzzling contrast and wry humour draw us into the first part of his arms cycle, which is economic motivation, regardless of the cost in destruction. Rather than: Niccol uses contrast and humour to make his point about the arms trade. Gandhi: Th. st.: Attenborough condemns British control of India by first providing physical evidence of British brutality—in settings, sounds, colours, and images—and then by highlighting more abstract verbal reasons why the British should leave India. T.s. 1: Settings increasingly suggest the British don’t control India. Rather than: Th.st. : Attenborough makes his point about the British in India by using setting, sound, colour, images, and verbal rhetoric. T.s.1: Attenborough uses setting masterfully to make his insights into British history in India. The Amritsar Massacre of April 13, 1919 resulted from a zealous application of the 1919 Rowlatt Act (an extension of the 1915 Defence of India Act). According to the Rowlatt Act, Indians could be arrested without a warrant and could be imprisoned for two years without trial if they were suspected of terrorism. Gandhi called it a black act and staged a peaceful hartal (Gujarati term for general strike) or Rowlatt Satyagraha (Satyagraha is Sanskrit for holding to truth). There were also violent protests against the Rowlatt Act, and the governor of the Punjab Michael O'Dwyer had declared martial law. As in the film, Brigadier General Reginald Dyer fires on an unarmed crowd in the Jallianwalla Bagh (Garden; here Compound) in the city of Amritsar. Prior to this, he banned all meetings, but this was not well-known and the Baisakhi festival was on. Dyer then faces a court-martial for the slaughter of 300+ and the wounding of 1000+. Mohandas K. Gandhi (1869-1948) was a Gujarati Hindu who trained at the Inner Temple (legal association, one of the four Inns of Court) in London. He practiced law in South Africa for 21 years (where he founded the Natal Indian Congress) and moved back to India in 1915. He was deeply disturbed by the Amritsar Massacre, which galvanized even stronger resentment against the British. India's National Congress party (founded 1885) was eager to implement the type of democracy Britain had exercized in England and in some (European populated) colonies -- like Canada and Australia. Gandhi employed democratic and nationalistic arguments, mixing these with the Hindu non-violent principle of ahimsa, combined with the Christian notion of turning the other cheek and Henry David Thoreau’s concept of civil disobedience. The Rowlatt Act was repealed in 1922. The governor of the Punjab, Michael O'Dwyer, had supported Dyer and was assassinated by Udham Singh in London in 1940. SPEAKER: England is so powerful – its army and its navy, all its modern weapons – but when a great power like that strikes defenseless people it shows it brutality, its own weakness! Especially when those people don’t strike back. That is why the Mahatma begs us to take the course of non-violence! . . . If we riot, if we fight back, we become the vandals and they become the law! If we bear their blows, they are the vandals –God and His law are on our . . . side. . . . We must have the courage to take their anger . . . Our pain will be our victory. ADC: Do we issue a warning, sir? DYER: They've had their warning – no meetings. Fire! … Take your time. Take your time. THE ARMORY HALL. THE FORT OF LAHORE. ADVOCATE: General Dyer, is it correct that you ordered your troops to fire at the thickest part of the crowd? ADVOCATE: One thousand five hundred and sixteen casualties with one thousand six hundred and fifty bullets. DYER: My intention was to inflict a lesson that would have an impact throughout all India. DYER: I think, probably – yes. HUNTER: General, did you realize there were children – and women – in the crowd? ADVOCATE: But that was irrelevant to the point you were making? ADVOCATE: Could I ask you what provision you made for the wounded? DYER: I was ready to help any who applied. ADVOCATE: General . . . how does a child shot with a 3-0-3 Enfield "apply" for help? THE VICE-REGAL PALACE. NEW DELHI. GOVERNMENT COUNCIL ROOM. CHELMSFORD: You must understand, gentlemen, that His Majesty's Government – and the British people – repudiate both the massacre and the philosophy that prompted it. GANDHI: If you’ll excuse me, Your Excellency, it is our view that matters have gone beyond "legislation." GANDHI: We think it is time you recognized that you are masters in someone else's home. Despite the best intentions of the best of you, you must, in the nature of things, humiliate us to control us. General Dyer is but an extreme example of the principle. It is time you left. GANDHI: Mr. Kinnoch, I beg you to accept that there is no people on earth who wouldn’t prefer their own bad government to the "good" government of an alien power. BRIGADIER: My dear sir – India is British! We're hardly an alien power! CHELMSFORD: Even if His Majesty could waive all other considerations, he has a duty to the millions of his Muslim subjects who are a minority in this realm. And experience has taught that his troops and his administration are essential in order to keep the peace. GANDHI: All nations contain religious minorities. Like other countries, our will have its problems. But they’ll be ours – not yours. GENERAL: And how do you propose to make them yours? You don't think we're just going to walk out of India. GANDHI: Yes . . . in the end you’ll walk out. Because one hundred thousand Englishmen simply can’t control three hundred fifty million Indians if the Indians refuse to co-operate. And that is what we intend to achieve – peaceful, non-violent, non-co-operation. GANDHI: Until you yourself see the wisdom of leaving . . . your Excellency. LATER. THE SAME GOVERNMENT COUNCIL ROOM. GENERAL: "You don't just expect us to walk out?" "Yes." BRIGADIER: Extraordinary little man! "Nonviolent, non-co-operation" – for a moment I almost thought they were actually going to do something. CHELMSFORD: Yes – but it would be wise to be very cautious for a time. The Anti-Terrorist Act will remain on the statutes, but on no account is Gandhi to be arrested. Whatever mischief he causes, I have no intention of making a martyr of him.